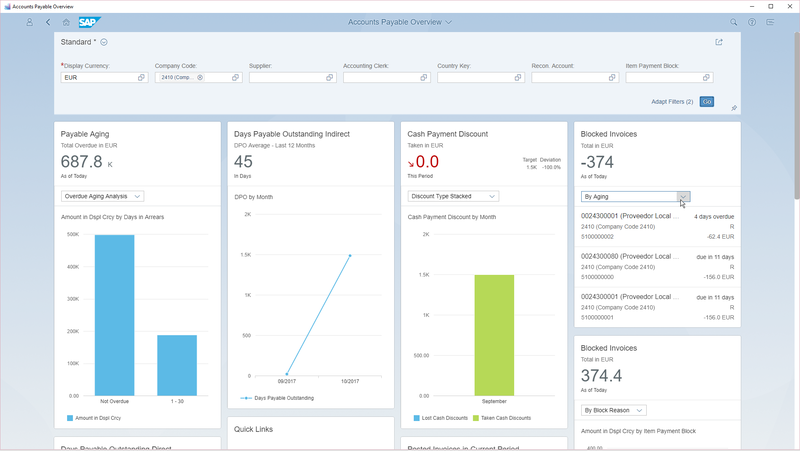 This blog provides you an overview of innovations in our SAP S/4HANA Cloud 1711 release for finance. Once more the high cycle rate of innovations kept us very busy in the last quarter for the sole purpose to stay on top and provide our customers the best and most intelligent Cloud ERP solution available in the market place. Today accounts payable managers face new challenges beyond of paying outstanding debt in a reasonable amount of time. They deal with an increasing volume of smaller transactions, while taking advantage of incentives, find efficiencies to reduce costs and optimize the cash flow. The new overview page functionality does not only support the AP manager to remain sovereign, but to focus on optimizing the KPI’s. By calling the new overview page you can see a KPI dashboard with all relevant information based on real-time data, such as payable aging, days payables outstanding per direct or indirect method, blocked invoices, cash payment discounts and so on. From here you can drill down into further smart apps to conduct more detailed analysis down to the level of each single line item. From there you can immediately conduct actions to optimize your business by sharing the KPI’s and process information with persons responsible for process execution in your line of business. Commitment management is part of the cost monitoring process. Commitment items are triggered by purchase requisitions and purchase orders for projects, and are reduced by various business transactions such as goods receipts. A project cost report shows commitments versus plan and actual costs. This provides a basis for predictive accounting and monitoring of the remaining budget because it reflects costs that are expected but not yet reflected in the financials accounts. Integration of Trading Platform 360 T. The new Treasury Management Integration for Trading Platforms enables you to integrate FX transactions made on trading platforms into SAP S/4HANA Cloud automatically. This scope item covers inbound communication with 360T, which means customers can upload FX Spots, FX Forwards, FX Vanilla Options, and FX Swaps automatically from 360T to SAP S/4HANA Cloud. You can also enter or change editable FX transaction custom fields after the FX transaction is uploaded into SAP S/4HANA Cloud. The process helps you to mitigate profit and loss volatility from the use of derivatives. The new functionality supports IFRS 9 Financial Instruments and covers cash flow hedge using FX Forwards (including NDF) as hedging instruments. The functionality helps you to automate labor-intensive processes, such as calculating net open exposure amount, creating hedging relationship for hedge item and hedge instrument, determining the key figures calculation (NPV, Forward, CCBS, CVA/DVA), performing the valuation of FX transaction, checking classification, dealing with the de-designation and generating posting journal reports. IFRS 9 Financial Instruments is the standard for the classification, measurement and impairment of financial instruments. The standard is to be applied for the first time for the reporting years beginning on or after 1 January 2018 and is applicable for Financial Institutions and to Non-Financial Institutions. The most significant effect of IFRS 9 for Non-Financial Institutions, will be the application of the new model for Hedge Accounting. It will be the most significant amendment to IFRS 9 Financial Instruments. The IASB and FASB have jointly issued the new revenue standard, IFRS 15 Revenue from Contracts with Customers. IFRS 15 is effective for annual periods beginning on or after January, 1, 2018. It is a single model for revenue recognition from contracts with customers. The principles in IFRS15 will be applied using a five-step model. The solution we provide with SAP S/4HANA Cloud is based on the already existing event-based revenue recognition solution which covers several IFRS 15 requirements such as matching principle for cost of goods sold and revenues. With this new release, we enhanced the solution to support bundling, the possibility to have multi-element arrangements in a contract. The solution supports revenue recognition for sales orders with delivery based billing as well as for customer project contracts (fixed price and periodic services). 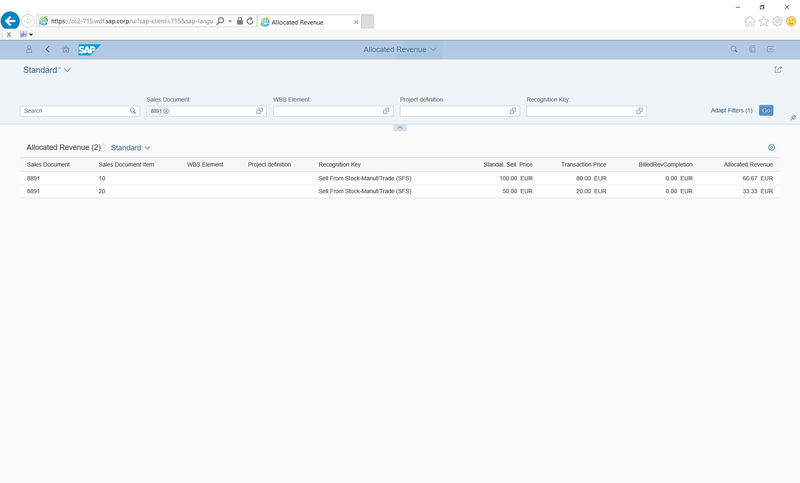 For reporting purposes for multi-element arrangements in contracts we introduced a new Fiori App “Allocated Revenue” and enhanced existing once.